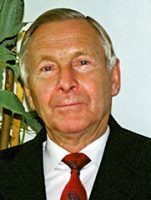 We regret to inform of the death of Prof. Czesław Druet, a longtime director of the Institute of Oceanology PAS in Sopot, an eminent Polish oceanographer, an expert on the dynamics of the sea and geophysical hydromechanics, a tutor of many outstanding scientists in the field of oceanography, an advocate of cooperation between the IO PAS and the NMFRI. He was awarded among other things, the Commander’s Cross of the Order of Polonia Restituta, as well as the Kazimierz Demel Medal. Polish science has lost a distinguished authority in the field of oceanography. The Management together with the Employees of the National Marine Fisheries Research Institute send their sincere condolences to the Employees of the Institute of Oceanology PAS and the Professor’s family. We also inform that the requiem mass for Prof. Czesław Druet will be celebrated on July 18th of this year (i.e. on Monday) at the St. Andrew Bobola Church (opposite the Grand Hotel) at 11.00. The funeral will take place at the Communal Cemetery in Sopot at ul. Malczewskiego.